The highly successful annual Napa music festival is now in it’s third year. This year’s line up boasts musical icons such as No Doubt, Robert Plant, and Imagine Dragon’s. 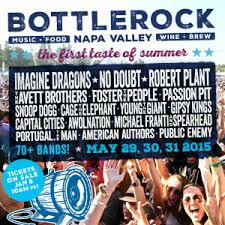 BottleRock Napa will also have a new stage to showcase some of Northern California’s culinary stars. “Williams-Sonoma Culinary Stage” will feature cooking demos and a variety of other activities with culinary greats such as Dominique Crenn of Atelier Crenn, Masaharu Morimoto of “Iron Chef” fame and Michael Mina of the Mina Group. This new culinary stage is much like the “GastroMagic!” stage found at San Francisco’s Outside Lands music festival or “The Pit” at West Sacramento’s TBD Fest, which included cooking demos and local chefs battling it out in a culinary competition. The standard fare just isn’t cutting it for a new generation of festival goers. Various musicians and other public figures are also getting into the act with these culinary rock stars. Those rumored to participate include: Snoop Dogg, Flavor Flav, Chad Smith of Red Hot Chili Peppers, Joe Kwan of the Avett Brothers, Vernon Davis of the San Francisco 49ers and many more. 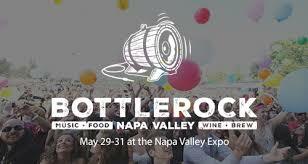 For more information about the Musical Lineup and the Culinary Lineup go to BottleRock Napa Valley’s website http://www.bottlerocknapavalley.com/. 3-day passes are already sold out but you can still buy 1-day passes.